These three circuits are all equivalent: (A) A resistor at nonzero temperature, which has Johnson noise; (B) A noiseless resistor in series with a noise-creating voltage source (i.e. the Thévenin equivalent circuit); (C) A noiseless resistance in parallel with a noise-creating current source (i.e. 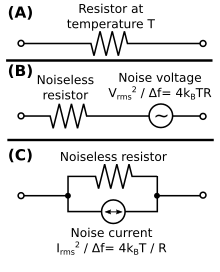 the Norton equivalent circuit). Johnson–Nyquist noise (thermal noise, Johnson noise, or Nyquist noise) is the electronic noise generated by the thermal agitation of the charge carriers (usually the electrons) inside an electrical conductor at equilibrium, which happens regardless of any applied voltage. Thermal noise is present in all electrical circuits, and in sensitive electronic equipment such as radio receivers can drown out weak signals, and can be the limiting factor on sensitivity of an electrical measuring instrument. Thermal noise increases with temperature. Some sensitive electronic equipment such as radio telescope receivers are cooled to cryogenic temperatures to reduce thermal noise in their circuits. The generic, statistical physical derivation of this noise is called the fluctuation-dissipation theorem, where generalized impedance or generalized susceptibility is used to characterize the medium. Thermal noise in an ideal resistor is approximately white, meaning that the power spectral density is nearly constant throughout the frequency spectrum (however see the section below on extremely high frequencies). When limited to a finite bandwidth, thermal noise has a nearly Gaussian amplitude distribution. This type of noise was discovered and first measured by John B. Johnson at Bell Labs in 1926. He described his findings to Harry Nyquist, also at Bell Labs, who was able to explain the results. Thermal noise is distinct from shot noise, which consists of additional current fluctuations that occur when a voltage is applied and a macroscopic current starts to flow. For the general case, the above definition applies to charge carriers in any type of conducting medium (e.g. ions in an electrolyte), not just resistors. It can be modeled by a voltage source representing the noise of the non-ideal resistor in series with an ideal noise free resistor. where Δf is the bandwidth in hertz over which the noise is measured. For a 1 kΩ resistor at room temperature and a 10 kHz bandwidth, the RMS noise voltage is 400 nV. A useful rule of thumb to remember is that 50 Ω at 1 Hz bandwidth correspond to 1 nV noise at room temperature. where P is the thermal noise power in watts. Notice that this is independent of the noise generating resistance. Thermal noise is intrinsic to all resistors and is not a sign of poor design or manufacture, although resistors may also have excess noise. Thermal noise in the resistor accounts for 100% of kTC noise, for any resistance value. In the extreme case of the reset noise left on a capacitor by opening an ideal switch, the resistance is infinite, yet the formula still applies; however, now the RMS must be interpreted not as a time average, but as an average over many such reset events, since the voltage is constant when the bandwidth is zero. In this sense, the Johnson noise of an RC circuit can be seen to be inherent, an effect of the thermodynamic distribution of the number of electrons on the capacitor, even without the involvement of a resistor. The noise is not caused by the capacitor itself, but by the thermodynamic fluctuations of the amount of charge on the capacitor. Once the capacitor is disconnected from a conducting circuit, the thermodynamic fluctuation is frozen at a random value with standard deviation as given above. , this noise is often called kTC noise. Any system in thermal equilibrium has state variables with a mean energy of kT/2 per degree of freedom. Using the formula for energy on a capacitor (E = ½CV2), mean noise energy on a capacitor can be seen to also be ½C(kT/C), or also kT/2. Thermal noise on a capacitor can be derived from this relationship, without consideration of resistance. The kTC noise is the dominant noise source at small capacitors. voltage noise described above is a special case for a purely resistive component for low frequencies. In general, the thermal electrical noise continues to be related to resistive response in many more generalized electrical cases, as a consequence of the fluctuation-dissipation theorem. Below a variety of generalizations are noted. All of these generalizations share a common limitation, that they only apply in cases where the electrical component under consideration is purely passive and linear. is simply equal to 1 except at very high frequencies, or near absolute zero (see below). Nyquist's formula is essentially the same as that derived by Planck in 1901 for electromagnetic radiation of a blackbody in one dimension—i.e., it is the one-dimensional version of Planck's law of blackbody radiation. In other words, a hot resistor will create electromagnetic waves on a transmission line just as a hot object will create electromagnetic waves in free space. , where λ is wavelength. This comes from the different frequency dependence of 3D versus 1D Planck's law. The full generalization of Nyquist noise is found in fluctuation electrodynamics, which describes the noise current density inside continuous media with dissipative response in a continuous response function such as dielectric permittivity or magnetic permeability. The equations of fluctuation electrodynamics provide a common framework for describing both Johnson–Nyquist noise and free-space blackbody radiation. ^ John R. Barry; Edward A. Lee; David G. Messerschmitt (2004). Digital Communications. Sprinter. p. 69. ISBN 9780792375487. ^ Anonymous (1927). "Thermal agitation of electricity in conductors". Proceedings of the American Physical Society: Minutes of the Philadelphia Meeting December 28, 29, 30, 1926. Phys. Rev. 29 (2): 367–68. Bibcode:1927PhRv...29..350.. doi:10.1103/PhysRev.29.350. ^ Johnson, J. (1928). "Thermal Agitation of Electricity in Conductors". Phys. Rev. 32 (97): 97–109. Bibcode:1928PhRv...32...97J. doi:10.1103/physrev.32.97. ^ a b c Nyquist, H. (1928). "Thermal Agitation of Electric Charge in Conductors". Phys. Rev. 32 (110): 110–113. Bibcode:1928PhRv...32..110N. doi:10.1103/physrev.32.110. ^ Lundberg, Kent H. "Noise Sources in Bulk CMOS" (PDF). p. 10. ^ Sarpeshkar, R.; Delbruck, T.; Mead, C. A. (November 1993). "White noise in MOS transistors and resistors" (PDF). IEEE Circuits Devices Mag. 9 (6): 23–29. doi:10.1109/101.261888. ^ Urick, V. J.; Williams, Keith J.; McKinney, Jason D. (2015-01-30). Fundamentals of Microwave Photonics. p. 63. ISBN 9781119029786. ^ Dicke, R. H. (1946-07-01). "The Measurement of Thermal Radiation at Microwave Frequencies". Review of Scientific Instruments. 17 (7): 268–275. Bibcode:1946RScI...17..268D. doi:10.1063/1.1770483. PMID 20991753. ^ Twiss, R. Q. (1955). "Nyquist's and Thevenin's Theorems Generalized for Nonreciprocal Linear Networks". Journal of Applied Physics. 26 (5): 599–602. Bibcode:1955JAP....26..599T. doi:10.1063/1.1722048. ^ Pitaevskii, L. P.; Lifshitz, E. M. (1980). "Chapter VIII. Electromagnetic Fluctuations". Statistical Physics, Part 2: Theory of the Condensed State. Vol. 9 (1st ed.). Butterworth-Heinemann. ISBN 978-0-7506-2636-1. Applet of the thermal noise.